From 1987 to 1989, I worked with wives of theology students at the United Church of Zambia Theological College in Kitwe, Zambia; their education ranged from Grades 5 to 12. While there, I led a weekly Bible Study session with the wives as well as Christian Education classes with the theology students including six young women – the first women permitted to study theology in this Protestant college of Anglican, Lutheran and United Church of Zambia students. The other ten babies either slept in the chitengi wrap on the mother’s back or were swung around to nurse contentedly. As a member of staff I took my turn to lead the morning chapel services before classes. I also invited all the women of our community to take part – the wives, the six female theology students and the six deaconess students. I used sections from the “UN Decade for the Solidarity with Women” worship resource. We did a little skit of the “Circle of Violence” of beating (gently) around the circle representing a man, woman, child, neighbour and dog. We learned the “Threads of Many Colours” song. They participated on Sunday, reading their lines – even those whose reading of English was slow. “Do you hear my voice, O God, my God? The words I hear all speak to me of men. The light in their eyes told me that the message of liberation, of a new freedom of their worth as women in God’s image was very real, even though they live in a patriarchal society in a church that still values traditional patriarchal Christian values — as so many do even in Canada. But the strength of the light came to the surface, when Jane, one of the theology students, usually a quiet and unassuming young woman in her twenties, read with conviction and growing animation, the story of the woman who had recently become the first African-American woman bishop of the U.S. United Methodist Church. “Like the women who witnessed the first Easter, we must continually tell the story, speaking truth to and with power, whether or not others hear it as nonsense. Because we believe Christ is alive now, both in the present and in the life to come, we are called to fullness, wholeness, freedom”. She then threw her hands in the air and shouted her last two words, “Praise God”. The others looked at her, eyes affirming, heads nodding, faces alight. When I asked what song they would like to use as they leave the chapel, as was the usual custom of singing and then shaking hands and making a big circle for community announcements, Helen began to sing in Bemba and the others joined in. When asked for a translation, Helen said: “Let us all work together as sisters and brothers in Christ”. I said, “That’s it exactly”. Then they repeated it in Bemba, gathering their things as they made their way out of the chapel, communicating with their singing and bodies what they knew they would have difficulty expressing in words. They swayed and danced, they shouted as they clapped, and joy was in the air. 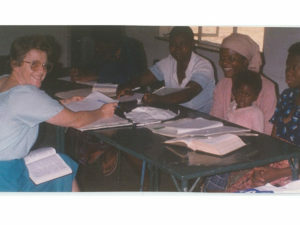 Eileen Wttewaall and her husband, Gus Wttewaall, taught at the UCZ Theologue College in Kitwe, Zambia 1987 to ’89, through the United Church of Canada. She is writing her memoir and shared this story.